Are you looking for an easy meal to serve? I’m always looking for an easy meal to serve! This Shrimp and Veggie combo is the perfect solution. It’s great for a family meal and it’s perfect for entertaining. This shrimp and veggie combo tastes great, but takes only 30 minutes to make. I believe in recipes that shorten our time in the kitchen. Do you? This busy working mom, especially in sports season, doesn’t have time for l-o-n-g recipes nor a whole lot of fuss so I’m all about make ahead, freeze ahead and quick recipes. Boil the pasta as instructed; I always go al dente. Drain the water. Toss it with 1 tablespoon of olive oil and a light sprinkle of sea salt. Wash and prep your veggies while the pasta is cooking. Snap the tough end of the asparagus off and then I snap my asparagus in half again, it stretches the vegetable. Cut the tomatoes in half. In a large pan, heat two tablespoons of oil. You will be treating this portion of the meal like a stir fry. Add in the asparagus and the garlic, stir as the cook. Add in the shrimp and the onion powder. Season with salt and pepper. As the shrimp turns pink and is almost done add in the tomatoes; cook until they begin to soften. Top the pasta with the shrimp and veggie combo. Top with sone shaved parmesan. The Shrimp: I use the fresh frozen jumbo shrimp that has been deveined. If you have to vein it yourself, you are adding time to your meal; the choice is yours! I do cook the shrimp in this recipe in the shell for flavor purposes. Everyone removes the skin and tail themselves = less work for you (wink). Lighter Yet: Don’t want the pasta? Serve this combo over a lightly sautéed zucchini noodles (mmmm double yum). Ready for the grill? Or, looking for that next prep ahead, freeze ahead meal? 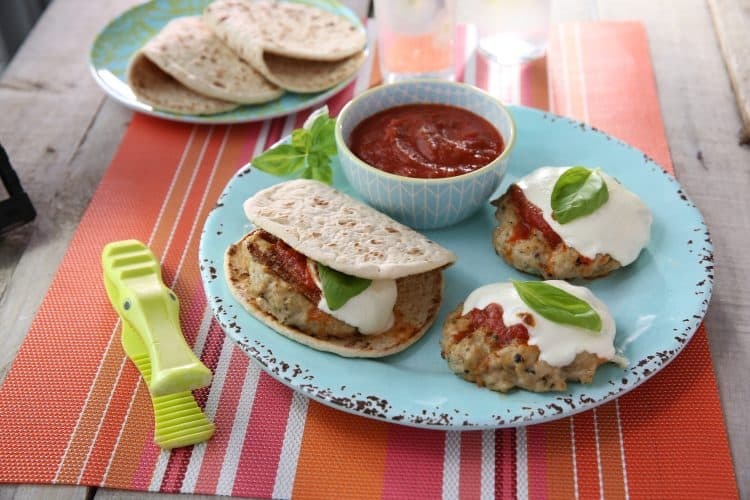 Try my Chicken Parm Burger Recipe = another easy dinner winner! CLICK HERE for the recipe and enjoy more yumminess. A lovely presentation for your Shrimp Veggie Dinner, it looks amazing! Thanks so much for sharing your awesome post with us at Full Plate Thursday and hope to see you again real soon! Thank you! It’s a winner weekday dinner :)….